An archetypal human CD8+ T cell clone exhibits broad but differing L– and D–amino acid recognition profiles. Clonal ALF3 CD8+ T cells were incubated with C1R-A2 target cells pulsed with CPL mixtures (100 μM) comprising nonamer L– or D–amino acids. MIP-1β release in the supernatants was quantified by ELISA. 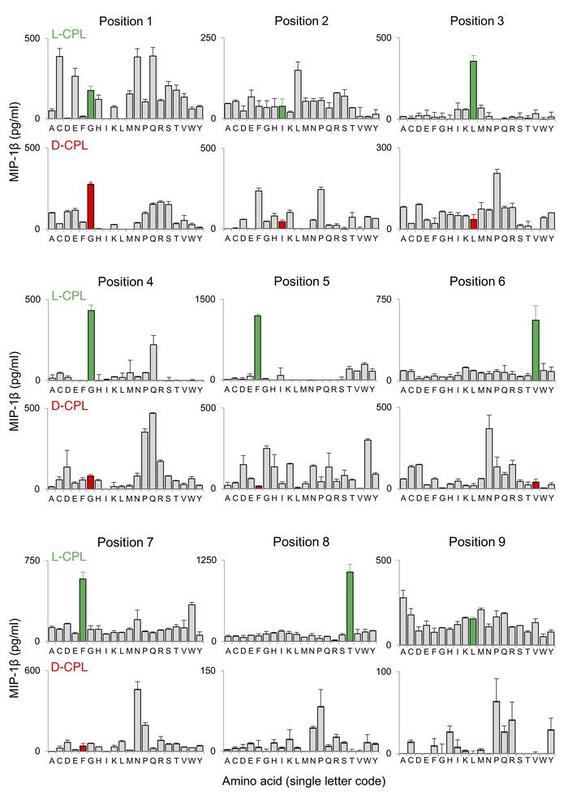 The amino acid residue in each position corresponding to the index GILGFVFTL peptide is depicted in green for the L-CPL screen and red for the D-CPL screen. Fixed amino acid positions (single letter code) along the peptide backbone are indicated. Error bars from 2 replicates depict SEM.